This isn't an update really, not at all, apart from to say I'm still alive and still writing, pounding away at the keyboard to produce my novel as a contestant in this year's NaNoWriMo. We are truly into the final quarter, week four. The picture is completely unrelated to what I'm writing about here, but because I've not put any images on this site for a while, I thought I'd put one in. 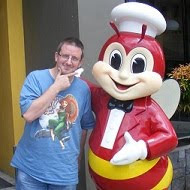 The image on the right is me, next to Jollibee, the mascot of the brilliant Filipino fast food chain of the same name. The photo was taken last month when I was in the Philippines. So here's how it's going: the total number of words as of the final few moments of 22 November 2012 stands at 37,631 words. The target is a minimum of 50,000 word by the end of the month. I'll give a proper breakdown of progress, etc., at some point over the weekend, but in the meantime, you can check out my statistics here. I'll be glad when this month is over, for two reasons: firstly, I'll have a completed novel written by me (my first major length piece), and secondly, I'll have time to start reading novels again, instead of writing them!